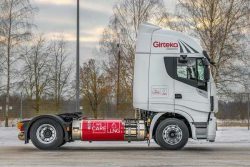 European transportation and logistics heavyweight Girteka Logistics, based in Lithuania, has been testing Liquefied Natural Gas (LNG) -powered trucks. It has found CO2 emissions reduction of 85 per cent is possible using the renewable fuel Bio LNG when compared to an equivalent diesel vehicle. The confirmation of LNG credentials opens up new possibilities for the operator of a company fleet of 5600 trucks. The discovery of environmental footprint was made after carrying out test runs with Iveco Stralis 460 NP LNG gas-powered trucks. Two more trucks of the same brand were submitted for testing in the same company this year. “We started our first tests with LNG trucks last year. Back then we already noticed that the distance of 100 kilometers covered by an LNG-powered truck is more efficient and protects environment on every kilometer. We checked both the fuel consumption and the distance that a fully tanked truck can cover. 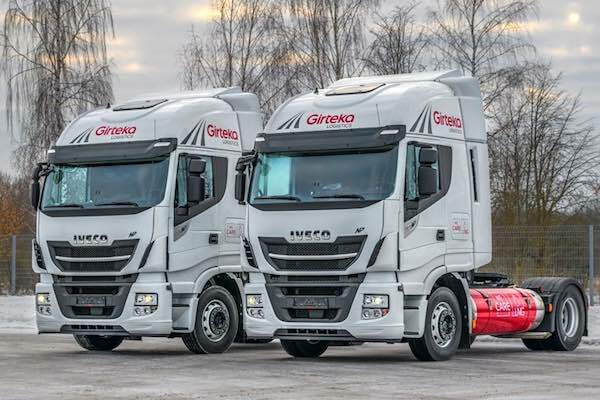 The results showed our drivers managed to drive 1500 km with a full fuel tank”, said Donatas Načajus, Chief Transport Officer at Girteka Logistics. Alternative transport is thought to cause too many problems, but IVECO long-standing experience shows it has significant advantages. Natural gas-powered transport uses up to 15 percent less gas, and with a full tank it can drive up to 1600 kilometers, which is maximally possible with a diesel vehicle. Most importantly, it is environment-friendly: CO2 emissions are noticeably reduced by using Bio LNG (up to 85 percent) and the reduction of particulates and nitrogen oxide (NOx) up to 95 percent.